Protecting your firearms means more than keeping them out of the hands of thieves or unauthorized users; it also means protecting them from disasters. Since most firearms are stored in the home the most likely disaster is fire. There were more than 1.3 million home fires reported in 2015, resulting in $10.3 billion in property damage. While theft is why most gun owners buy a safe fire is more likely occurrence. This is why a fireproof safe is necessary if you really want to protect your guns and the investment they represent. The average temperature for a house fire is approximately 1,100 degrees F. It is important that you select a safe capable of withstanding temperatures above this minimum temperature, otherwise the heat will eventually damage anything inside. 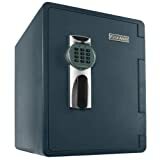 It is also important to consider how long the safe can withstand the maximum temperature- if you live in town 20 minutes is the average response time but if you are in a rural area it could be much longer. Those living in older, wooden structure will also want a longer time rating as single rooms may burn longer than those constructed of bricks, concrete etc. Most people think that water resistant safes are for those living in flood prone areas, but they are also vital to fire resistance as well. Why? Because fires eventually mean water – that is what firemen use to put the fire out. There is no point protecting your firearms from the flames if the firemen ruin them putting those flames out. As an added bonus water resistant safe will provide protection during floods as well, some will even float for easier retrieval. There is no national standard for water resistance so it is important to look at how the safe is constructed, any through the wall opening should be sealed and seals must be solid. Many of today’s safes utilize biometric or electronic keypads as a means of operating the lock, some even use smartphone apps. Make no mistake these are excellent means of providing fast, easy access when the guns are needed but will likely become damaged during a fire. This means it is important that your safe have an alternative, preferably mechanical, means of unlocking it after the fire. If you do not have this feature it is likely you will need to hire a locksmith, or a man with a torch, to get the door open and you firearms out. Now, let’s review some of the more popular fireproof safes on the market and see how they stack up against each other and the considerations listed above. Following each safe we have provided a helpful link to allow you to check latest availability and pricing via Amazon. This safe is capable of withstanding temperatures up to 1550 degrees, more than most house fires will ever reach. Plus, it can withstand this temperature level for up to 45 minutes – exactly what you need if you live in a rural area. As the safe is exposed to higher temperatures the door seal will automatically expand, providing additional protection from both smoke and water. The electronic keypad lock control is not only fast but also provides additional protection from EMP attacks (electromagnetic pulse, often associated with nuclear strikes or electromagnetic weapons). After a fire you will still be able to access the safe via the high security back up keys. Constructed of heavy gauge steel, with 4 ¾” drill/ballistic resistant door and 5/8” layer of fireboard ( doubled in door) you will be hard pressed to find a stronger construction. With interior dimensions of 55 ¼” x 19 ½” x 9 ¾” it is advertised as being capable of holding up to 16 long guns and 4 shelves are available to accommodate handguns or accessories too. High temperature and time rating. Provides excellent theft protection as well. No dehumidifier available, will need to be added. If storing ARs or other firearms with magazines capacity is much less. If you have a lot of guns you will need a lot of safe and the Buffalo 32 provides just that. With a capacity of 32 long guns, and an additional 11 handgun pouches mounted to the inside of the door, this is one step below having your own armory. With a rating of 1200 degree for 2 hours it provides one of the longest levels of fire protection available. If the fire department is not there by then there is a good chance the fire will burn itself out. It also includes quality door seals for protection from smoke and water damage. The three spoke handle looks like an old time safe, but the electronic keypad offers modern access speeds. Should the keypad become inoperable there are two back up keys included. The heavy 14 gauge construction, solid weld design and heavy weight not only provide additional protection from fire but provides excellent all around security as well. Huge capacity, 32 long guns and 11 handguns. Moveable shelves make it very customizable. Very heavy, may not be suitable for apartments or small homes. Price is on the higher end of the scale. This is another really big safe – both in the number of firearms it will accommodate and the protection it provides. At 68”x 36.25”x 54.23” this safe can accommodate a whopping 51 long guns, 8 handguns and up to 5 ammo cases and the 8 shelves provide plenty of versatility as well. Resistant to temperatures up to 1700 degrees for 1 hours, longer at lower temperatures, means the average house fire has met its match. Plus, it exceeds Department of Justice requirements and will likely meet those of any insurance provider as well. The special expanding heat seal is vital in ensure full heat protection and also means moisture will be keep at bay as well. The combination of 12 gauge steel construction, powder coating finish, 5/16” thick drill resistant lock plates and steel pin doors provide excellent security. The main locking mechanism is operated by an electronic keypad, complete with automatic spring-loaded locking device, protects against break in attempts will also providing carefree access when needed. Expandable seal for water & smoke protection. Drill resistant door and lock. Handgun holsters are not repositionable. If you only own handguns but still want a reliable fireproof safe then First Alert has the answer – the 2096DF. It is UL certified to withstand temperatures of up to 1700 degrees for one hour. Plus, water damage is a thing of the past due to the composite constructions and expanding seal which will protect the contents even if fully submerged. Constructed from a combination of steel, concrete and ABS plastic you get a heavy duty safe in a small package. 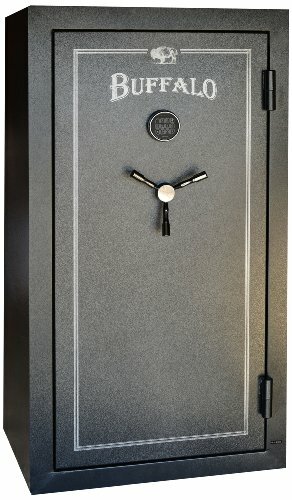 At only 25” x 23” x 19” you get a safe small enough to accommodate several handguns as well as accessories and ammunition. 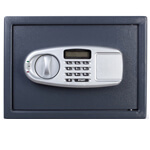 The 2096DF is operated by a programmable digital lock with a keypad and two security keys. These keys can be used as a backup means of access or, for added security, you can program it to require both combination and key for entry. 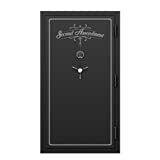 Your safe comes complete with two adjustable shelves, a key hanger, door pocket and 4 AA batteries. Simply remove it for the box, insert batteries and set your personal 3 to 8 passcode and you are ready to protect your firearms from theft, unauthorized us and fire. Provide excellent protection is a small package, perfect for handguns and apartment owners. 5 year limited warranty, life time after fire warranty. Carry handle and wheels available for easy relocation. ABS Plastic exterior can be easily damaged, does not impact security just cosmetics. Several incorrect keypad entries makes key necessary for entry. So, there you have it –what to look for when selecting a fireproof safe and some examples of what is available. Hopefully, this list contains something that will suit your needs. If not I hope it will help you in making your final selection. DependablesSafes is a participant in the Amazon Services LLC Associates Program, an affiliate advertising program designed to provide a means for sites to earn advertising fees by advertising and linking to Amazon.com.